Hello and welcome on this (still dark) morning, it’s Jenny here! As the days are getting shorter and the nights longer- alongside my working hours- I thought it was a good time to share some much needed caffeine with an equally worn out writer. 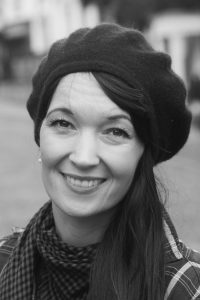 So, let me introduce you to Loreley Amiti- fellow writer and all round lovely person. This morning Loreley and I have put our pens aside so we can chat in front of an open laptop. Let’s see what happens… Are you ready, Loreley? Yes, definitely. As ready as I’ll ever be at this early hour. Hello everyone! So, tell me, what are you up to at the moment? That’s a good question, as there are so many things going on at once. I have two readings coming up on 26th and 27th October, which I’m really looking forward to. 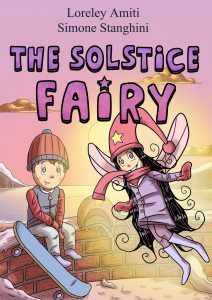 Are these for your children’s books? 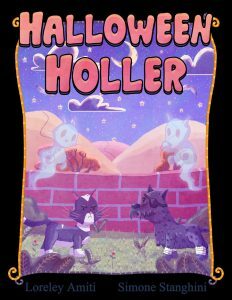 Yes, I’ll be reading my latest picture book “Halloween Holler”, which is about the grumpy cats of the North of Exeter who want to take over the feared dogs of the South. They’re planning on conjuring up a mighty cat army on the night of Halloween but unfortunately for them, the dogs have the same plan and things go terribly wrong. No, no, it’s not that bad. It’s for small children, after all. Just really funny, because they’re all hilariously grumpy and in the end, they make friends when they least expect to do so. Does that mean you will stop writing children’s books then? I know what you mean! Have you got a favourite book among the ones you have written? I should be saying “all of them”, shouldn’t I… Of course, I love them all for very different reasons. I don’t have a favourite to be quite honest, but I love “Halloween Holler”, for example, because the leader of all the grumpy cats, Luke, was based on the character of our own cat. It’s just heart-warming to see my little daughter showing our cat the illustrations of Luke and telling him the story in her own words. She also told him off for always looking so extra grumpy in the book. She is not very impressed with me though, because Luke lives with a boy called Ben, which is clearly wrong. – Silly Mummy! That’s brilliant! So where can we find you and your new book? Well, it’s obviously on Amazon and can be bought or ordered in bookshops. 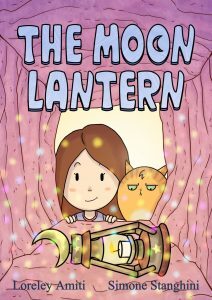 But I hope to get to see many of my local readers on 26th October at the Exeter Halloween Fun Run and on 27th October at Exeter Library, of course. Thank you, Loreley! I hope you’ll get a full house. Thanks for having me, Jenny! Loved our caffeine chat! You are very welcome. Come by again soon! Thanks hun! Lovely to have a break! Good luck with Halloween adventures.